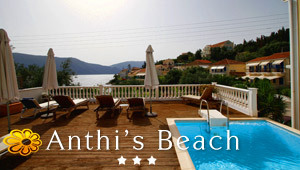 Poros Kefalonia: Poros beach is quite famous for the picturesque settlement that lies around the natural bay. Poros is found 40 km east of Argostoli, the lovely capital of Kefalonia surrounded by an enchanting environment. Poros is one of the island's ports, located very close to the beach which attracts many swimming lovers due to the crystal and calm waters. Poros beach is covered with white pebbles that join with the see and is quite known for its cosmopolitan atmosphere and the tourist infrastructure. Umbrellas and sundecks cover a small part of the beach while the other remains unspoilt for those who like some privacy. Poros has a unique natural surrounding to show off, starting from the mountainous greenery hillsides to the crystalline waters of the Ionian Sea. There are many accommodations available in the village and several monuments to see.